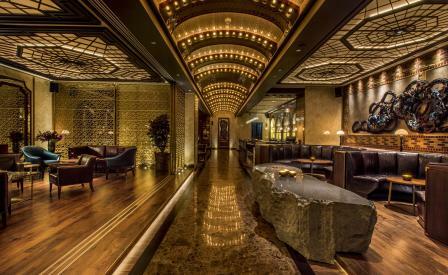 At first glance, Charles H could almost write the checklist for the contemporary incarnation of the speakeasy: tucked below ground level, with a discreet entrance that opens onto a snug realm of mahogany and velvet, where bottles twinkle coyly in art deco-framed recesses behind an imposing ebony bar. It’s even named after a prominent figure from the Prohibition era: Charles H Baker, a globetrotting American cocktail expert who’s said to have inspired many of the house concoctions. However there’s a lot less unabashed nostalgia, and a lot more local inspiration, than initial appearances might suggest. New York-based designers AvroKO have crammed the venue with references to Korean royalty, from a striking seven-metre tapestry of braided velvet and silk knots that evoke the intricate hairstyles of the former gentry, to the auspicious symbols etched subtly into tables and chairs. Even the bottle collection includes over 100 antique decanters, calling to mind the old apothecary cabinets still found in stores and homes across the region. All this would mean little in a hard-drinking city if the cocktails weren’t up to snuff, but they are, with the list striking a healthy balance between innovation and the classics (including multiple incarnations of the Manhattan). More than just mood, in Charles H AvroKO has created a place of mystery, whose secrets may require repeat visits, or at least a few drinks, to uncover.